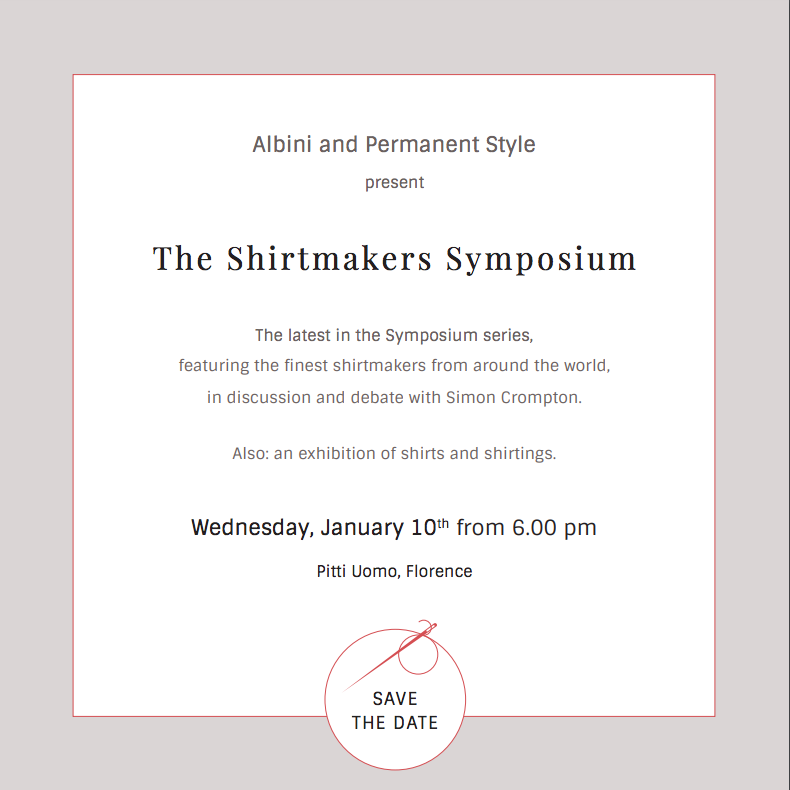 After the summer hiatus, the Symposium series is back in January - with a look at some of the finest shirtmakers in the world. With the help of Albini, we will be staging a display of shirts and shirting in a central-Florence palazzo, followed by the usual debate on stage. The shirtmakers, from different parts of the world, will be announced later. We will also detail the items on display, the location and the RSVP details. As ever, we start early and finish relatively early, so there's plenty of time for everyone to get to dinners or other events. For the moment, if you're going to be in Florence and are interested in stimulating debate about the menswear we know and love, put the date in your diary. You can follow the discussion on Come to The Shirtmakers Symposium by entering your email address in the box below. You will then receive an email every time a new comment is added. These will also contain a link to a page where you can stop the alerts, and remove all of your related data from the site. I feel like there is more potential for debate on this topic than with, say, tailors. Shirtmakers actually use different construction techniques, fused v floating or handwork v no, whereas most tailors do everything the same way. Should be interesting to see some of the rationalizations. Anon, I have to disagree. Within tailoring, you have fused vs floating canvas. There are also hand stitched elements. In addition, far greater variations in cut and style. Just my pennies worth. Anon 1 to Anon 2. While I see where you are coming from, no tailors discussed on this blog use a fused canvas or less than an acceptable minimum for handwork. I agree on the style point, though nobody argues about wether a style is good or bad, unlike construction. While I won’t be able to attend, I’m really looking forward to this, hoping you will have a video similar to the young tailors symposium. so glad to see another symposium, I’m looking forward to seeing which shirtmakers will be there! have you ever thought about doing a perminant style pitti guide? there seems to be very little information around and I’m sure you could do an amazing job of it. Interesting idea. I guess the problem I always saw with going to Pitti as a consumer is that the fair is largely useless – it’s all things that may be available in a year, if a retailer buys them, or may not. And either way you can’t buy them soon. The events are nice, but there’s only a handful of them that are any good. Aside from running the symposium, what is your interest in Pitti? Given you are not a buyer, is it mostly about seeing trade friends? It’s primarily as a journalist covering brands. It’s a great way to meet a brand, arrange an interview, take photos of them and so on. Even with UK brands, it’s often easier to meet them all there, in one place at one time. In such an interview, it matters less that the products aren’t necessarily the right season. Of course, in recent years as we’ve done more collaborations, it is also a good opportunity to meet makers – such as Umbria Verde for the knitwear. Hi Simon, I collected my first shirt from Luca Avitabile in London last week. It’s so lovely. I hope this question is on topic enough: Do I recall you once writing that you prefer your shirts with one fewer button than usual, for the purpose of allowing for a more open chest when undoing the top two buttons undone (ie, the collar and throat buttons)? Thank you. No, not one more button than usual, but the third button a little lower than some put it. Dear Simon, will the symposium be open to everybody? I would like a lot to come to listen to you.